Two big romantic works may be sensory overload, but what a treat. The Fine Arts Quartet completes its 2016-17 season at the University of Wisconsin-Milwaukee Sunday afternoon with a concert focused on two masterworks by Robert Schumann. Schumann wrote dense, exciting music that expanded the world of chamber music, creating the kind of drama usually reserved for an orchestra. This is particularly true of his quartet and quintet for piano and strings. These two works are particularly challenging for the pianist. The FAQ will manage this concern by engaging two pianists — the Witkowski Duo — to split the responsibility. 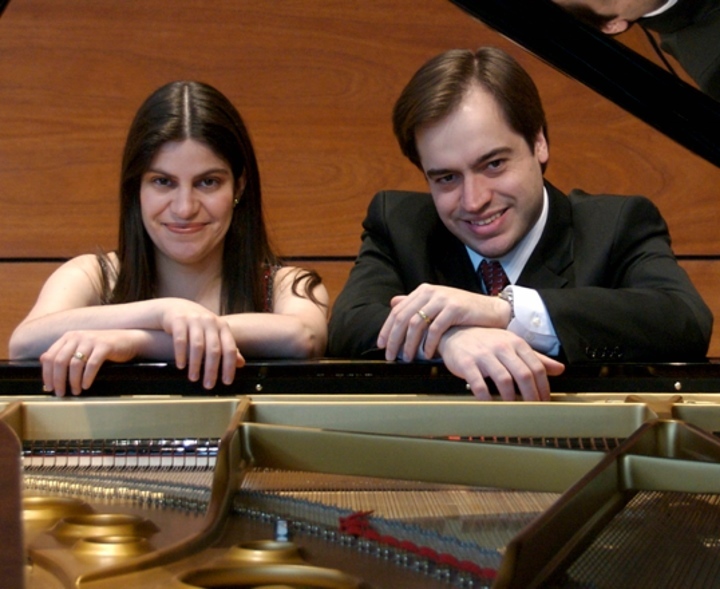 Brazilian pianists Fabio and Gisele Witkowski now live and teach in the United States. They have maintained an active schedule of recitals around the world, including Carnegie Hall, Kennedy Center, China, the Amalfi Coast Music Festival in Italy and many appearances with orchestras around South America. Concerts with chamber players have also been an important part of their schedule. The Duo played with the Fine Arts Quartet last year in Italy. 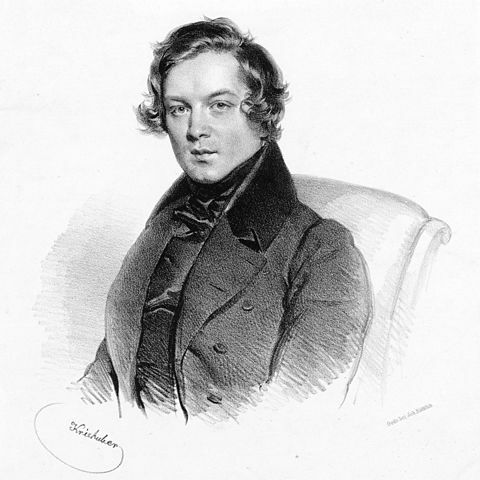 Robert Schumann – 1839 lithograph by Josef Kriehuber. Photo is in the Public Domain. Schumann’s Piano Quartet in E flat, Op 47 (1842) opens with measured hymn-like harmonies in the strings, only to be interrupted by an aggressive piano exposition. The pace remains driven through much of the rest of the quartet, excepting a cantabile slow movement featuring cello and viola in an impassioned Romantic melody. Schumann manages to embed brilliant lyrical themes even within an exuberant Finale, ending in a complex, rapidly-paced fugue. Schumann’s Piano Quintet, also in E flat, Op 44 (1842) allows the piano the lead from the very beginning. The “slow” movement expresses the cadence of a solemn march. Rapid-scale patterns drive the scherzo. An ambitious final movement ends with two major fugal sections, one a three-voice double figure. Either of the two works would crown a concert, leaving players exhausted and audience exhilarated. To hear both in one sitting may be sensory overload, but of the very best kind. The Witkowski Duo will also play several short Brazilian works for piano four-hands, each featuring the complex rhythms and energy of Brazilian dance: Gaiety of a Children’s Band (from Carnaval das crianças), W157, (1919)) by Heitor Villa-Lobos (1887-1959) and several small works (No Fundo do Meu Quintal, Lundu, and Congada) by Francisco Paulo Mignone (1897-1986). Considered the greatest Brazilian classical composer after Villa-Lobos, Mignone used folk and popular melodies and forms of his native Brazil as a basis for his compositions. The Summer Evenings of Music series begins with a concert Sunday, June 4 at 7:30 p.m. and continues at the same time on June 11, 18 and 25th. The final, 55th Fine Arts Quartet season (including Summer Evenings of Music) at UW-Milwaukee will be free and open to the public. Series ticket subscribers can still reserve SEOM seats during an advance ticket window, May 1 through May 18, at the Zelazo Box Office. The general community can begin requesting seats on Friday, May 19. Concert date and guest artist information is available online (as always, guests and programs are subject to change). The Box Office will announce at a later date when the final academic season tickets will become available.